I saw The Dark Knight Rises this weekend. Did you? Did you love it? I LOVED IT. I know this is blasphemous, but I actually liked it more than I liked The Avengers. Don’t get me wrong, I really enjoyed The Avengers; it is a fun, clever, and funny movie with a great (and attractive) cast, and also Joss Whedon. However, I like my superheroes dark. Pitch black, actually, My favorite graphic novels are Neil Gaiman‘s Sandman series and Watchmen, and those are pretty dark (see my posts here and here). 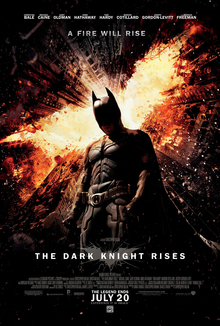 I just love Nolan’s Batman trilogy. I know it isn’t everyone’s cup of tea, but the dark and brooding and graphic and realistic grittiness of the series really appealed to me, and so many scenes from each film are ingrained in my head. While this movie wasn’t as good as The Dark Knight, mostly because Bane just isn’t as visceral and ferocious a villain as Heath Ledger‘s (RIP) astonishing Joker, this was an awesome film and you TOTALLY NEED TO GO SEE IT. So a few very loose comments because I don’t want to spoil anything: Anne Hathaway and Joseph Gordon-Levitt are great (particularly Anne Hathway, she’s just the best, and I adore the design on this particular Catwoman costume), and all the returning actors are also excellent in their roles. Some fantastic French Revolution/Robespierre undertones. Tom Hardy is a good actor but Bane’s mask allows him to showcase so little, so I feel for him. Overall SO GOOD. Have you seen the film yet? What did you think? *I’m going to mention the Aurora shooting because it would be dumb if I didn’t: it is all kinds of levels of terrible. Batman is supremely anti-gun. I think we all need to take a hint from Batman. I don’t have any profound words, just that what happened in Aurora was terrible, and that periodically during the movie my thoughts went to the victims and their families, and people can be terrible, and such.